I had just enough time for a walk around the labyrinth at ACU. The wind was blowing hard as I walked the path. I realized that life is like that. At times, the winds blow and try to take you off course. Sometimes, they actually do get you off the path. But if I keep my eyes and purpose on the path, God is faithful to help in the midst of the winds of change. Another takeaway from my time on the labyrinth was that you don't always have to finish something to get benefit from it. I was about 3/4 of my way through the labyrinth walking when out of the corner of my eye I saw two children barreling down the hill bound for "my" labyrinth. They ran across the labyrinth and started talking excitedly and loudly as children sometimes do wondering where to start the maze. When they saw the start of it they, you guessed it, decided to walk it as quickly as possible. My initial irritation turned to peace as I realized that I don't always have to complete a task to gain benefit from it. 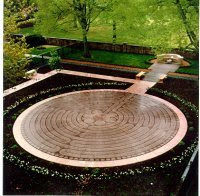 I left the last 1/4 of the labyrinth "unwalked" for today. That's o.k. God is teaching me when OCD is good and when it doesn't help me. Sounds like you did the right thing. Left part of the path unwalked. :)And you found peace in the unfinished task! Loved this sentence: "But if I keep my eyes and purpose on the path, God is faithful to help in the midst of the winds of change." What Makes our Spirits Soar?